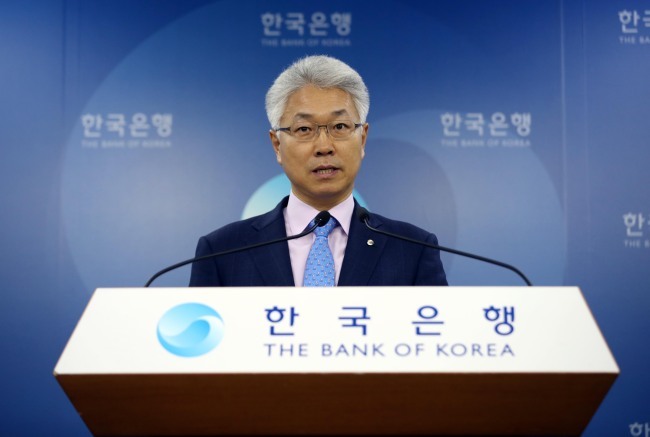 The South Korean central bank is expected to raise the country's key rate this month to curb the overheated property market, a global research firm said Sunday. "We believe the Bank of Korea will hike the policy rate by 25 basis points (0.25 percentage point) to a terminal rate of 1.75 percent in November 2018 in response to financial imbalances associated with higher house prices," Nomura Financial Investment Co. said in its latest report. Citing low inflation pressure and weak signs of economic recovery, the BOK has maintained the base rate at 1.5 percent since November 2017, when it lifted the rate from a record low of 1.25 percent for the first time in more than six years. But there have been growing calls to adjust the rate as the BOK's monetary policy committee is set to meet amid massive household debt and high-flying housing prices. South Korea posted a total household credit of nearly 1,500 trillion won ($1.33 trillion) in the first half, while apartment prices in Seoul have kept rising for years. Eased administrative and financial regulations and low borrowing costs have been blamed for an oversupply of liquidity and the property boom. Against this backdrop, the BOK has given some signs of a rate hike by the end of this year, with its last rate-setting meeting slated for Nov. 30. Nomura said the South Korean central bank will keep the rate unchanged for more than a year due to the sluggish economy and lower it to 1.5 percent again in 2020. "We expect GDP growth to slow from 2.7 percent in 2018 to 2.5 percent in 2019 and further to 2.3 percent in 2020," it said. "(It will) thereafter keep rates at 1.75 percent until it delivers a 25 basis point rate cut to 1.50 percent in 2020."